Allen Hood teaches beginner to advanced fiddle, with a background of music theory, intonation, double stops, and bowing styles. While the emphasis is on southern Appalachian fiddle tunes, interested students can get exposure to regional American, Irish, European, bluegrass or contemporary fiddle styles. Also Allen has experience teaching special needs students such as the Visually Impaired, or the Blind Student. 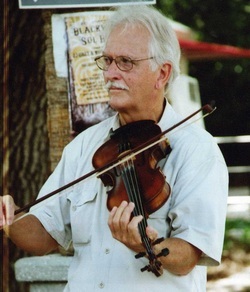 Allen Hood was the Official State of Florida Old Time Fiddle Contest champion in 2006 and 2010. He has taught and coached three 1st place contest winners at the state contest and at the Florida Old Time Music Championships in Dade City. Click-to-play Slow & Moderate speed Beginner Level Fiddle Lessons on-line. On-line Lessons are by annual subscription only, or on DVD for purchase now. See Free Demo on Home Page. Please go to the Contact Us page and submit your request for access to our On-Line Lessons Page for 1 year. Subscribers have unlimited access to all 12 Beginner Level Old Time Fiddle Lessons played slow and played semi-fast. For payment information fill out the Contact Us form.